She has to resign her Miami Beach seat to run for Congress. Instead, she’s suing. Kristen Rosen Gonzalez is claiming the newly passed "resign-to-run" law doesn't apply to her. A Miami Beach commissioner running for Congress filed a lawsuit Tuesday challenging a newly expanded state law that would force her to give up her city seat in order to seek higher office. 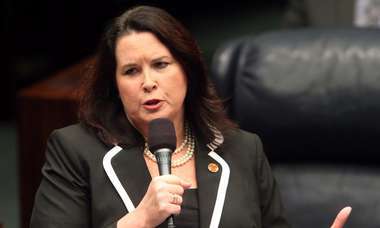 In a move that carries implications across the state, Kristen Rosen Gonzalez filed a complaint in circuit court, arguing that the new resign-to-run bill signed into law last month by Gov. Rick Scott violates her rights under the state constitution and can't be applied retroactively. The lawsuit names Scott, Florida Secretary of State Ken Detzner, and Miami Beach City Clerk Rafael Granado as defendants. "This is another example of Rick Scott and the Republican super majority taking away people's rights to benefit the party," Rosen Gonzalez said in a statement. "When we are faced with injustice we have a choice. We can take it sitting down or we can fight it. And I choose to fight." The law that Rosen Gonzalez is seeking to thwart was expanded this year to force politicians holding local and state elected office to resign their seats in order to qualify as a candidate for a federal office, if the terms of their current position overlap with the position they're hoping to win in the upcoming election. Under the law, such a resignation can be post-dated months down the road. But it must be irrevocable and submitted to the state 10 days prior to the qualifying period to make the ballot. That would give Rosen Gonzalez, who has about 18 months left on her city term, until April 20 to decide if it's worth giving up her commission seat in order to run for the congressional district currently represented by the retiring Ileana Ros-Lehtinen. If Rosen Gonzalez qualifies for the ballot, but doesn't resign, the law states that Scott can strip her of her city position. Kent Harrison Robbins, one of two attorneys representing Rosen Gonzalez, said the state can't force officials elected months and years ago to give up their seats given that the new law doesn't explicitly state that it should be retroactively applied. And even if it was explicit, he said, the people who elected Rosen Gonzalez to the city commission have a vested property right in her city commission seat. "We're dealing with a statute that doesn't apply to her," he said. If successful, Rosen Gonzalez's lawsuit would have ripple effects across South Florida, and likely the state. Two other Miami Democrats seeking to represent Florida's 27th congressional district — Miami Commissioner Ken Russell and State Sen. Jose Javier Rodriguez — said last week that they intend to resign during the next 10 days. Miami-Dade Commissioner Bruno Barreiro, a Republican seeking the same seat, resigned his post last month. Rosen Gonzalez has filed an emergency motion for a temporary injunction, and hopes to have a judge quickly hear her case. In Miami-Dade, 63 percent of black students and 46 percent of Hispanic students who qualify now for the top scholarship would lose eligibility under the proposed changes, compared to 40 percent of white students.